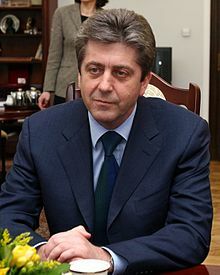 Georgi Sedefchov Parvanov (Bulgarian: Георги Седефчов Първанов, Template:IPA-mk) (born 28 June 1957) is a Bulgarian historian and politician. He was President of Bulgaria from 2002 to 2012. He was elected after beating incumbent Petar Stoyanov in the second round of the November 2001 presidential election. He took office on 22 January 2002. He was reelected in a landslide victory in 2006, becoming the first Bulgarian president to serve two terms. Parvanov supported of Bulgaria's entry into NATO and the European Union. This page was last changed on 6 February 2019, at 18:13.